From a very early age, Lewis Hamilton knew what he wanted to be when he grew up - a racing driver. And he and his family were prepared to do whatever it took to realise that dream. While his father Anthony worked several jobs and re-mortgaged the house to pay for his son to race go-karts, Hamilton kept his side of the bargain - impressing on the track. Then aged 10, the Briton walked up to McLaren team boss Ron Dennis at an awards ceremony and calmly told him that one day, he wanted to race for his team. Dennis penned a note in his autograph which read "give me a call in nine years". But it took just three years for Dennis to do a deal, signing Hamilton to McLaren's young driver programme. From there, Hamilton rose through the ranks quickly and after winning the GP2 Series title in 2006, he was granted the dream - a McLaren F1 race seat for the following year. Narrowly missing out on the title in his first season, the Briton was not to be denied in the second. Leading Felipe Massa by seven points going to the season finale in Brazil, Hamilton needed only to finish fifth, even if Massa won. But in a rain-hit race, he found himself sixth on the final lap. As Massa crossed the line to win the race, his family celebrated what they thought was his maiden title. But behind them, fourth-place Timo Glock, still on dry tyres in wet conditions, was dropping down the field. Hamilton caught and passed him on the penultimate corner of the final lap to take fifth - and with it the title. Since then, Hamilton, 29, hasn't had the car to challenge for a second title - until this year. Arriving at the season-finale in Abu Dhabi with a 17-point lead over team-mate and title rival Nico Rosberg, Hamilton went on to take victory, sealing the second title his talent arguably deserved. Born in Stevenage, Hertfordshire in January 1985, Hamilton got a taste for motor racing when his father bought him a radio-controlled car aged six. He was soon racing it on the BBC's Blue Peter - the first of three appearances on the show - before he started go-karting at Rye House Kart Circuit. So impressive was Hamilton's form that McLaren signed him, including an option of a future F1 seat in the contract, and rewarded him with funding to progress through the ranks. In 2000, partnering Rosberg, he became European karting champion and a year later, he finished seventh in a exhibition karting event, four places behind seven-time world champion Michael Schumacher. 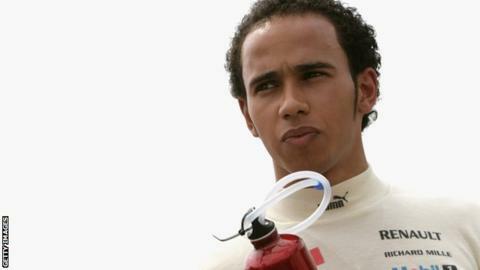 Hamilton claimed the Formula Renault title in 2003, and the following season Williams could have signed him only for their engine supplier BMW to pass up the chance. According to Patrick Head, co-founder of Williams, BMW said they didn't have the budget to fund Hamilton so the team couldn't sign him. Onwards with McLaren backing, Hamilton won the Formula 3 Euro Series in 2005 and then the GP2 Series title the next season. Progress like that could not be overlooked. McLaren signed him for 2007, alongside reigning double world champion Fernando Alonso. The first part of the mission was accomplished. In the lower ranks, Hamilton had made a name for himself with his ruthless racing instinct, raw speed and mentality that only victory was good enough. On getting behind the wheel of a Formula 1 car, Hamilton didn't waste his chance, scoring podiums in nine successive races. More impressively, he was regularly beating his more decorated team-mate. The Briton's first win came in Canada with another win in the United States the following week. Suddenly, he was leading the championship. But then his season unravelled, with crashes and an increasingly fractious relationship with Alonso, slowing his progress. And despite coming into the final race of the season four points clear of Alonso and seven ahead of Raikkonen, the title slipped through his fingers. With Alonso now at Renault, it was a more harmonious affair at McLaren in 2008, and Hamilton reached the finale in Brazil with a seven-point lead over Felipe Massa. "Hamilton is probably more popular today than at any time in his career. People were perhaps not so sure who he was when he first came in, and then there was a period when we kind of lost Lewis a bit as he was growing into being the multi-millionaire racing driver. "But now he has firmly found who he is -­ his own sense of style, what he likes in terms of partners and lifestyle, LA, all that sort of thing. And what we are left with is a sense of sincerity. His heart-on-the-sleeve style seems to have connected with the public." But for the second successive year, it looked like the title would be snatched away again, as Massa crossed the line to win with Hamilton sixth - one place below where he needed to finish - only for a pass on Timo Glock, in the penultimate corner, secured fifth and his first title by a single point. The 2009 season was miserable, with just nine points scored in nine races, and though he secured two wins later in the year, he was never in the title hunt. The following three seasons with McLaren yielded little and Hamilton's patience with the outfit that had made his F1 dream a reality finally ran out. The Briton announced he would join Mercedes for 2013, driving alongside former karting team-mate Rosberg. The season proved to be his most unsuccessful in terms of race wins, with a single victory in Hungary his only triumph, but Hamilton quietly bedded himself into his new team, ready for a title tilt in 2014. It immediately became clear that the Mercedes was the dominant car of the field, following the introduction of new engine regulations, and Hamilton went on to win 10 races - to his team-mate's five - with one race to go. Needing second place to secure the title in Abu Dhabi, Hamilton went one better, passing his team-mate at the start before going on to win the race - and his second world title, six years after his first. Hamilton isn't just a sportsman, he's a celebrity. The Briton has a pop star girlfriend, a scarlet red private jet and top spot on The Times List of wealthiest sportspeople in 2014 with an estimated worth of £68m. Hamilton is prolific on the social networks, with 2.45m followers on Twitter, and gives fans a behind-the-scenes insight into his life with everything from images of his holidays with family and girlfriend Nicole Scherzinger to a day out meeting the players of his favourite football team Arsenal. The Briton attended this year's GQ Awards, where he hung out with Kanye West, Pharrell Williams and Sam Smith, to pick up his award for Sportsman of the Year and dovetails that lifestyle with his work for charity Unicef, meeting children in Haiti back in June. He used to live in Switzerland but now resides in Monaco, where he's been pictured with Magic Johnson and Samuel L Jackson on a boat in the harbour. The Briton has spent time in a recording studio with rapper Angel and as if that's not enough, he made his film debut - in cartoon form - when he made a cameo in Disney Pixar's Cars 2. As well as voicing the character, he is said to have helped design his car and have some input into the film. The 29-year-old has admitted to having a sweet tooth and is often seen with a bag of sweets - he loves Haribo cherries. He's partial to a Jaffa Cake, too. His family, which includes pet dogs Roscoe and Coco, plays a huge part in his life, with the Briton having said that they are more important in life than winning. When asked what tastes like home, he said a roast dinner, because it's something his family used to always have on a Sunday. Despite the celebrity lifestyle, Hamilton was spotted doing his shopping in Waitrose last week with girlfriend Nicole Scherzinger.